Lhasa is the brainchild of Alain Raes from Siegen, Germany. As a teenager he was inspired by Tubeway Army's “Are Friends Electric” and Art Of Noise’s “Beatbox”. In 1985 he began collecting analog equipment (Prophet-5, Oberheim OB-X, Linn LM-1) as digital synthesizers had started to become more popular. In 1986, New Beat was born in Belgium. Dancers tapped into the darker side of synth pop, and DJs would play 45 rpm records at 33 with the pitch control set to +8. Alain was playing in New Wave bands and had started production work and synth programming for other acts. 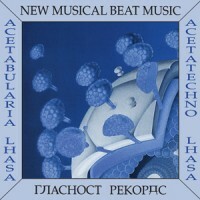 In 1988 he self-released the debut Lhasa single "Acetabularia / Acetatechno", with help from Kris Tremmery on vocals and concept. The record combined the icy melodies of Gary Numan and John Foxx with the mechanical rhythms of Detroit techno and EBM. Thematically, both tracks revolve around the end of life on Earth, and include samples from ‘Dr. Strangelove’. For this first time reissue, 4 bonus tracks are rescued from a 1990 recording session DAT tape. These demos show further development of the Lhasa sound with updated instruments (Roland D-20, Yamaha TX16W, Korg 707), faster tempos, and menacing proto-rave energy. All songs have been mastered by George Horn at Fantasy Studios in Berkeley. Each copy includes an 11x11 poster with photos and liner notes by Alain. Matt says: Ever reliable Dark Entries shine a light on some absolute EBM fire from Lhasa; shuddering into focus across a dancefloor of smoke, green lasers and stentch of poppers. Mega.